This table was very easy to make out of scrap 2 x 4 lumber (about 13') and a 1 ' x 2' sheet of plywood, left over from building the garage. It works well. The plans came from the WOODMALL free plans." They appeared originally in the Oct 1996 issue of WOOD (p. 14). 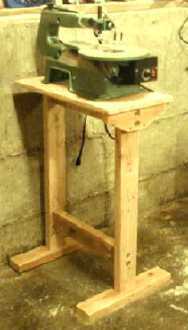 Later note: since the big workbench is completed, I moved the saw there (lower shelf) and use this stand (with trimmed 4x4 on top (cut down to fit) as a support for large work on the table saw. Still later note: since I built the router table I use that for table saw outfeed. This little table has been relegated to attic storage. Maybe I'll make a birdhouse out of it.